The Reel to Real: A Celebration of Moving Images for Youth Society is a non-profit registered charity dedicated to showing the best in culturally diverse, authentic programming for youth. Reel to Real presents an annual film festival, the Reel 2 Real International Film Festival for Youth, and media arts programming year-round. Through public screenings, hands-on workshops, interactive panel discussions, and public forums, our mission is to involve youth in actively viewing and discussing professionally made films; expose youth to new ideas and cultural perspectives; offer high-quality cinematic entertainment outside the mainstream; explore issues that are important to youth; engage youth in discussions with filmmakers about their work; increase understanding of the art and craft of filmmaking; and promote the production and presentation of high quality independent films for youth. TICKETS TO WIN! SEND US AN EMAIL! For her tenth birthday, Cathy’s whimsical father gives her a present that is a little out of the ordinary: a duck egg. Her father warns her the duckling will think the first person it sees is its mother. Against all odds, that first person is not Cathy, but Margaux. While Cathy is quite prepared to let Margaux play the role of mother duck, Margaux’s parents have a different view. Overwhelmed by their daughter’s physical disability, which confines her to a wheelchair, they don’t believe she is capable of taking care of a pet. Afraid that the duckling will end up as canned cat food, Cathy and Margaux set out on an adventurous journey to set the duckling free in its natural habitat. This family film is about friendship, responsibility, and the need to be independent. Recommended for ages 10 and up. * Followed by R2R’s Opening Night Party! Eleven-year-old Leo becomes an unlikely superhero when he discovers that he has the ability to leave his body and fly through walls. 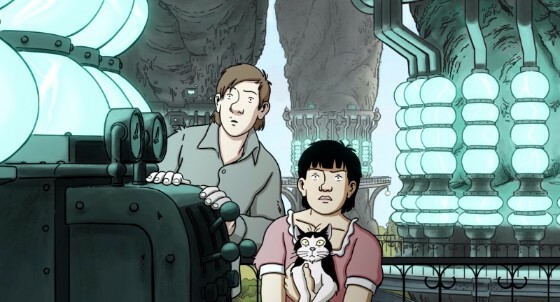 This hilarious and marvellously animated adventure comes from the creators of the Academy Award-nominated A Cat in Paris. Recommended for ages 10 and up. This riveting sci-fi adventure is set in Paris, 1941. Descended from a family of scientists, April lives alone with her cat, Darwin, working in secret to discover the truth behind the disappearance of her parents. She soon finds herself in the middle of a shadowy conspiracy. This animated film is inspired by the work of renowned graphic novelist Jacques Tardi, and is produced by the team behind Academy Award nominated Persepolis. The intelligent and spirited April is voiced by Academy Award winner Marion Cotillard, La Vie En Rose. Recommended for ages 10 and up.